When I lived in Anchorage, Alaska, the local farmers' market was right across the street from where I lived. I went nearly every Saturday to stock up on vegetables for the week from about May when it opened to the beginning of October when it closed. It was so convenient! For a while, I also participated in the local Community Supported Agriculture (CSA) and got a box of vegetables every other week from a farmer in the Matanuska-Susitna valley. I was spoiled. When I moved back to Valdosta, the farmers' market was further away and not so conveniently located. It only takes about 15 minutes to get there, but it's way out of my Saturday circuit of grocery shopping and errand running. Besides, this past spring, we decided to grow our own vegetables (organically, too). We did pretty well until I killed the plants. We'll try again next year, but in the meantime, I decided I should start going back to the farmers' market and make driving down there my treat for the day. This past Saturday, when I walked into one of the markets on South Patterson Street again, the smell of the fresh vegetables took me back to my childhood when I used to go with my dad to the curb market in the late 1950s/early 1960s. I loved going with him and seeing all of the shelled peas in the wooden vegetable stands. I'd stick my hands in them, and my dad would say, "Get your dirty hands out of the peas." I don't remember what kinds of peas they were, but I bet they were field peas, acre peas (my favorite when I was a kid), black-eyed peas---all kinds. Not the round, green peas. I hated those with a passion when I was a kid. Although, I eat them now on occasion. 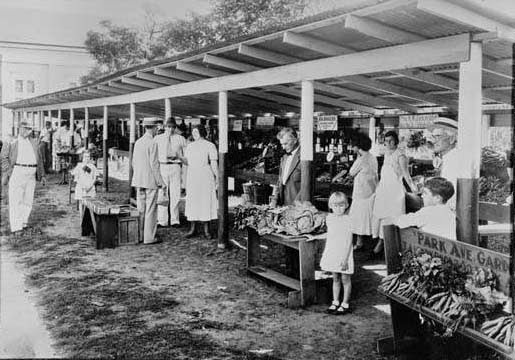 A curb market in Valdosta, Georgia, in 1934. That looks like the current City Hall building (formerly the post office) in the background on the left. My dad would buy some of the shelled peas or butter beans and a bushel of the unshelled ones. I knew what was in store for me when I got home---shelling. For a little while at least. I would help my mom shell peas or butterbeans until I lost interest and ran off to play, leaving her with the chore. I still remember sitting with a colander in my lap that was filled with pods. I'd drop the shelled peas or butter beans into the colander as I went. When those were done, I'd get another handful. I also remember my sore thumbs from shelling!